Cummings Lane, showing the owners of lots and the location of houses and outbuildings in 1931. Detail from Frank H.M. Klingé, Atlas of Montgomery County, Maryland, Volume One, p 3, 1931. According to the 1931 Klingé map shown above, there were thirteen houses built on Cummings Lane since Harry Martin began selling lots in Martin’s Additions in 1905. On the north side of Cummings Lane, technically in Martin’s First Addition, there were six homes, including Martin’s former house, sold to William Orme in 1908. On the south side, there were seven homes built by 1931. Lot size and shape varied. As you walked east from Brookville Road, the lots on both sides of the street became deeper. Martin’s house, later the Orme house, was built on a very large corner lot, as was the house belonging to the Helmuths at the southeast corner of Brookville and Cummings. Many of the houses on Cummings Lane were built on double lots. 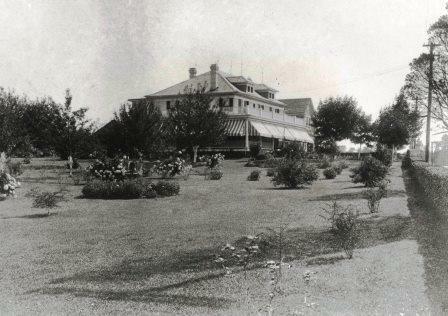 Some lots show no structures in 1931, such as the two lots owned by Agnes Cummings at the eastern edge. Agnes and her nephew, Andrew J. Cummings, Jr., would build a substantial brick house there in in 1947, after the Cummings family sold Pleasant Grove and the farm land that surrounded it. In this section, we provide additional information about the inhabitants of three of the earliest houses built on Cummings Lane in Martin’s Additions: first, the Orme family’s house, which was the very first house in Martin’s Additions, originally built by Harry M. Martin for himself; and then the two houses built for the Stone and Teele families, both by local builder/architect Albert N. Prentiss. 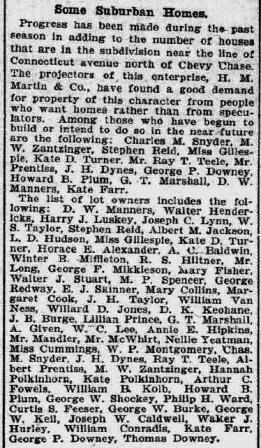 The Teeles moved to their home in 1906, but moved back to the District of Columbia in 1918, after selling their home to the Reichmuths. The 1931 Klingé map shows the name of the second owner of this property, the Reichmuths). The Stone family lived in their house until George Winchester Stone, Sr. died in 1957. 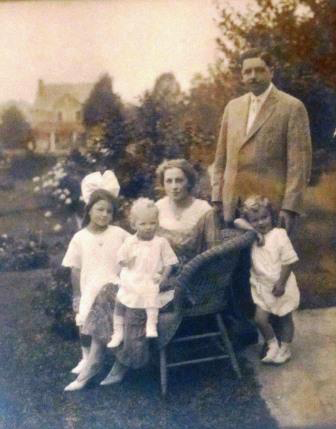 William and Amelia Orme and their children outside their home on Cummings Lane, c. 1914. Courtesy of Cece Cummings. William and Amelia Stahl Orme bought their home, now 3517 Cummings Lane, from Harry Martin in 1908. A traditional four square craftsman style home, situated at the eastern side of a very large corner lot, the house was soon expanded by Mr. and Mrs. Orme for their young family. Mr. Orme was originally from Georgetown, one of six sons of James W. Orme and Ella Chery Orme. William Orme's parents had a home in Brightwood, named Valley View, in addition to their home in Georgetown. In 1905, at the time of his sudden death, James W. Orme was the acting President and a large shareholder of the Washington Gas Light Company. According to newspaper obituaries, he was also connected with Capital Traction Street Railway, Riggs National Bank, and Corcoran Fire Insurance Company. 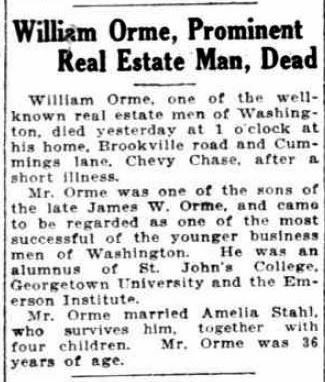 James W. Orme’s estate, estimated at his death to be $565,000 in personal property and $500,000 in real estate, was left to Mrs. Ella Orme and her six sons: William, Henry A., James W., Charles H., Edgar, and Gardner Phillips Orme. William Orme attended St. John’s College High School, Georgetown University and the Emerson Institute. He became well known in Washington business circles in the field of real estate. 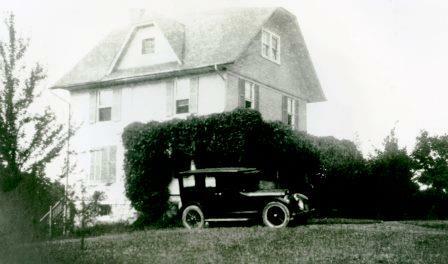 In 1906, he married Amelia Stahl, and two years later, they purchased their home in Martin’s Additions. The house as built by Harry M. Martin. From a photograph lent by Andrew J. Cummings, Jr. CCHS 2008.20.04. The house after it was expanded by Mr. and Mrs. Orme. CCHS 1988.15.01. William and Amelia Orme enlarged the house, almost doubling its size. This expansion can be seen in a comparison of two photographs shown above, one taken before and the other after the expansion. In the photograph on the left, there is just one dormer window on the third floor; in the later photograph, shown on the right, there are two dormer windows, and the front porch extends along the new addition. Mr. and Mrs. Orme had five children. 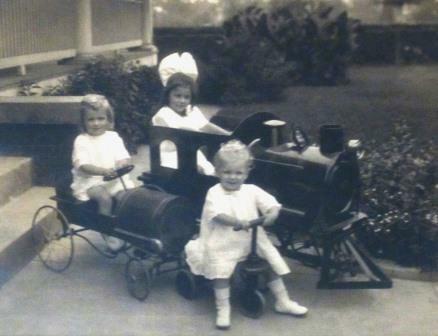 Three of the Orme children, c. 1914. Ida Orme Cummings is on the tricycle in front. Courtesy Cee Cee Cummings. The Washington Herald, December 5, 1918, p. 2. In 1918, during the flu epidemic, William Orme traveled home on the train from New York City to DC. Unfortunately, the man sitting next to him had the flu. Mr. Orme became ill and died at his home on Cummings Lane on December 4, 1918. He left his wife, and five young children. Mrs. Orme continued to live at the house until her death. Ida Orme, William and Amelia’s third child, married Andrew J. Cummings, Jr. in 1943. 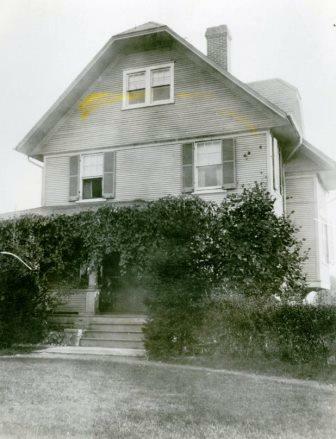 After the war, Mr. Cummings and his Aunt Agnes Cummings built a home at the other end of Cummings Lane, and Andrew and Ida lived with and took care of Agnes until her death in 1950. They raised their two daughters, Cecilia and Elizabeth, at this house. Cecilia and her son live there today. Ida Orme Cummings died in 1992, and her husband died in 2011. The east facade of the Stone house, 3506 Cummings Lane, 1924, from George Winchester Stone, Jr. CCHS 2008.202.03. George Winchester Stone (1865-1957) and his wife Mary Bradford Stone (1868-1946) moved to their home on Cummings Lane in 1909. George worked as an architect in the Supervising Architects’s Office. They had two sons, Bradford W. and George W. Stone, Jr. Their household also included Mary’s sister Faith Bradford who lived with them for many years; she worked at the Library of Congress. In addition, the Stone's house was the temporary home for a number of foreign students. 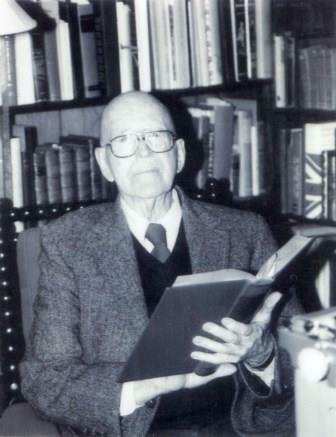 George Winchester Stone, Jr., taken in 1993 at the time of his CCHS oral history interview. CCHS 1993.06.06. My family moved into No. 410 [the street number was changed to 3506 in the 1950s] on a dirt-and-gravel surfaced Cummings Lane in 1909. The house had been built by Albert Prentiss, situated fifty or sixty yards from Brookville Road, past a field of grass and briar patches. The Lane was lined with large, old Cedar trees, which prompted the inhabitants, for a time, to call it officially, "Cedar Lane," and Harry Martin had designated it on the original Plat as Cedar Avenue. Both attempts failed to stick. After all it had long provided egress from the Cummings farm. Mr. Stone remembered those who lived on the street – and the many residents who walked to the Connecticut Avenue streetcar. At the top of Cummings Lane lived the wealthy Mr. William Orme, one of six brothers, who were partners in the Emerson-Orme Buick Distributors in D.C. At the farm end lived Miss Bertha Erdmann, a government employee but also a seamstress of skill long over from Germany who owned a two family structure. She never lost her heavy Germanic accent, so was a puzzle to us as youngsters. "Guten Morgen," she would say as she walked past to the street car. Agnes Cummings, one of Cy's sisters walked daily (as did all others) to the cars on Connecticut to attend her office in the Treasury Department. My Aunt, Faith Bradford, who lived with us, catalogued books in the Library of Congress, and later headed its Division of Serial Records. 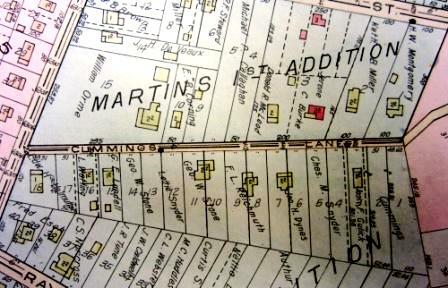 There were large fields – vacant lots, really – between the early homes on Cummings Lane and and other streets in Martin's Additions. Mr. Stone describes an annual (or sometimes bi-annual) practice of burning the grass growing on those "un-improved" lots. The large fields between Cummings Lane and Raymond Street, between Cummings Lane north to Shepherd Street, and on up to Thornapple (both east and west of Brookville) lay uncared for from early spring until late fall -- save where a junior baseball area was trodden out. The grasses grew abundantly and rattled in the dry September air. Often in the Fall (occasionally in early Spring) at eventide after the men had returned from their offices downtown, someone would drop a match, purposely, and soon the territory would be ablaze. Word passed and soon men and boys came out with brooms, rakes, and dampened gunnysacks to tend these field fires and keep them from encroaching on gardens or spreading to buildings. The exercise was exciting, the sight was beautiful against the dark sky, and the result probably beneficial to the ground and its scrub foliage. The land, we felt, was never scorched, just fertilized. The Stone house taken in 1924, from George Winchester Stone, Jr. CCJS 2008.202.02. The early homes on Cummings Lane had individual wells – a public water supply would come much later. These new suburban houses had pumps that brought water to the kitchens and bathrooms, similar to the water pump at the Cummings farmhouse. Each house possessed a large circular or oval tank with capacity of 500 gallons aloft in the attic. Filled and refilled periodically, it started the gravity flow of water through the pipes below stairs. Water source came from dug or drilled individual wells. At our house in 1909-1911 the well-water arrived top-side by aid of a small wind mill. But by 1912-13 tank-filling ceased to rely on the vagaries of wind power as we broke-in a gasoline engine in a pump house shared with neighbor [Ray Palmer] Teele. Whenever that failed, we worked man and boy at 100 strokes each on a large pump handle before going to school or to work. The still partly rural landscape was a great place for the children growing up on Cummings Lane in the teens and twenties. The children of both sexes were a busy and self-occupied lot. We climbed trees, chewed sassafras leaves imagining them wads of tobacco, cut paths through briar patches making a maze with difficult passages, caught butterflies for a collection, skated, biked, played (on cool evenings) dodge ball, or red rover in each other's front yards, learned to dance, did the leg work for the week end ice-cream sales (McKeever's vanilla from Kensington was delicious and special), explored the surrounding woods, and jumped from shed-roof to barn-top up at George Medler's playing cops and robbers. We played step-up school on any family's front step when the girls were around. As automobile traffic increased on Brookville Road, local residents grew concerned about the safety of children on their way to school, and for pedestrians in general. Mary Bradford Stone led a community effort to construct a sidewalk along Brookville Road, and kept the pressure on “Cy” Cummings, the state representative. My mother, excessively community-minded and certainly persistent, pressured Cy to lay on a sidewalk from Turner lane south along Brookville Road to Sonneman's Store at Quincy Street so that matrons and children would have safe passage from gradually increasing traffic. She mobilized the “Community Club," getting members to put on ice-cream and bake sales every Friday at the juncture of Bradley Lane and Brookville to raise some venture capital (or matching contributions). And she kept the heat on Cy. “Mrs. Stone," said he on one occasion, “if we didn't spend so much on the darned schools we'd have more for streets, roads and sidewalks.” He was more broad-minded than that irritated comment bespoke, yet sidewalks appeared, and Cummings Lane together with Raymond and Shepherd Streets became paved -- great joys indeed for the roller-skating generation among others. Composite Photograph showing both 3502 and 3506 Cummings Lane, 1985, from two photographs talen by Ellen Conley. CCHS 2013.11.07. The Stone family sold their home after George Winchester Stone, Sr. died in 1957. The Stone's house was torn down, and the double lot was divided into two separate lots, each with a new house. Mary Bradford Stone was born in Massachusetts, but moved with her family to Washington, DC in 1881. Her father, formerly a Congregational minister, worked for the Bureau of Indian Affairs. Mary attended Mrs. Elizabeth J. Somers School, later Mount Vernon Seminary, after she completed public high school. She planned to go to college, but family finances did not allow it. She kept in touch with Mrs. Somers, however, and shared with her former teacher her good luck earning a raise, from $900 to $1,200 a year, as a draughtsman for the U.S. Postal Service. On the basis of this raise, she traveled to Europe in 1890 with a friend, and surprised her family by sending dispatches to the Evening Star newspaper. Her son George Winchester Stone, Jr., wrote “A Profile of the Life and Character of Mary Knight Bradford Stone,” in 1985, which includes a copy of this same news report of her adventures "in a little Swiss town." 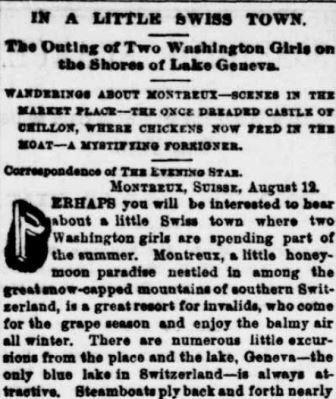 Mary Bradford, “In a Little Swiss Town, The Evening Star, August 30, 1890, p. 12. In 1902, she married George Winchester Stone, and they lived in the District until they moved to Cummings Lane in 1909. They raised two sons, Bradford W. Stone, and George Winchester Stone, Jr.
Mary was involved in many community activities in Chevy Chase. She and her husband participated in the Chevy Chase Roundtable, a series of literary and social meetings. She was active in the Red Cross, the Women's Christian Temperance Union., the Y.M.C.A., the Women’s Club of Chevy Chase, the Florence Crittenden “circle” in Chevy Chase, and in various church related groups. She was also a member of the Chevy Chase Reading Class for several years. She and her family often hosted foreign students, with some living at the house on Cummings Lane for long periods of time. Faith Bradford was born in 1880, the year before her parents and older sister moved to Washington DC. Following Mary Bradford Stone’s footsteps, she attended Mrs. Elizabeth J. Somers School, later Mount Vernon Seminary, and graduated in 1900. She remained close to Mrs. Somers and the school, as was chosen to write the biography of Mrs. Somers for the fiftieth anniversary of the school. In 1903, she began her training as a librarian at the Washington Public Library, where she worked until 1907. In 1908, she began working at the Library of Congress; she would continue to work there for the forty years. In 1942, she became Head of the Card Division, the first woman to hold such a position. Faith lived with her sister Mary and brother-in-law George from 1908 to 1957, commuting to work each morning on the streetcar. In the summer time, she took over a renovated chicken-house which she called her “Chickalow” – a kind of chicken-house inspired bungalow. She made the “Chicalow” her summer quarters, and created a lovely garden around it, especially notable for her boxwood collection. In 1948 she retired from the Library to maintain the household on Cummings Lane for her brother-in-law, her sister Mary having died in 1946. There she brought to the full her creative energy in preparing the Dolls House, with 19 rooms and a large attic, with its family of Peter Doll and his ten children, with its furnishings all perfectly to the scale of an inch to a foot. She had been collecting items for forty years (and refusing out-sized gifts of furniture), and used great ingenuity in constructing furnishings to make the house complete, as an example of the style of living of a well-to-do family in the first decade of the twentieth century. 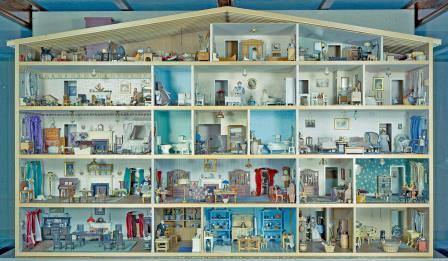 The photographs below show the doll house – in its earlier form as rooms in a bookcase, and later in the doll house her nephews built. Faith Bradford’s dollhouse in a bookshelf, c. 1930s, courtesy of William C. Bird, Jr., Smithsonian Institution National Museum of American History, 2006. CCHS 2008.390.01. 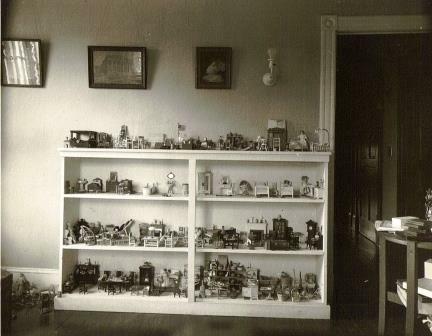 Faith Bradford’s dollhouse, c. 1950s, in the NMAH, courtesy of William C. Bird, Jr., Smithsonian Institution National Museum of American History, 2006. CCHS 2008.390.02. Many say that the house represents life in the Stone house on Cummings Lane. After Faith’s brother-in-law George Winchester Stone, Sr. died in 1957, the house on Cummings Lane was sold. Faith Bradford moved to an apartment in the District of Columbia. She died at age 90 in 1970. The Evening Star, October 21, 1905, Part 3, p. 1. Teele home – and the Stone home which was located next door. Mary Hazard Teele’s sister Lucretia was married to Mr. Prentiss, and perhaps that is why they hired Mr. Prentiss to build their house. On June 26, 1906, Ray Palmer Teele signed the deed for lots 8 and 9, situated roughly mid-block on Cedar Avenue, as Cummings Lane was called on the official plat map for Martin’s Third Addition. In this original deed, a restrictive covenant was included that prohibited the property from being sold, rented, or leased to “a colored man or one of the African race,” as was customary in all of the original land transactions under Harry Martin. This covenant did not appear on any subsequent deeds. Like many of his neighbors in Martin’s Additions, Ray Palmer Teele worked for the federal government. He was originally from Nebraska, and he received his B.A. and M.A. degrees by 1899 from the University of Nebraska. He married Mary Hazard soon after his graduation, and they moved to Washington, DC, where he worked as a clerk in the Department of Agriculture. Their son, Ray Palmer Teele, Jr., was just three years old when they moved to their new home on Cedar Avenue/Cummings Lane. 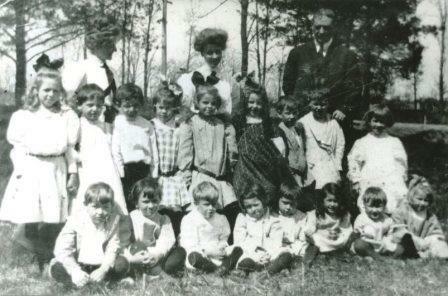 Ray Palmer Teele, Jr. attended Klein’s Bakery Kindergarten, as shown by this class photo, probably taken in 1908. He would later become a physicist and the author of many scientific articles. Ray Palmer Teele, Jr. in the first row, among his kindergarten classmates at Klein’s Bakery School, c. 1908. Teachers standing in back: Miss Aiken, Unknown, Mr. Murch (?). Back row of children, left to right: Eloise Bowen, Edith Claude, Leonard Giovannoli, Jean Tucker, Mary McCauley, Betsy Marine, Nathan Robertson, Miles Imlay, Cora Bowen. Front row, left to right: Emerson Hodges, Unknown, Palmer Teele, Unknown twins, Elsie (Last name Unknown), Unknown, Agnes Ridgeway. From an original photo belonging to Cora Bowen Martin, donated by Edith Claude Jarvis. CCHS 2008.140.13. The Teele family quickly became involved with Chevy Chase social life. In 1907, the Literary Club of the Chevy Chase Association was formed, and Ray Teele was elected president. The first meeting of the annual October to May season was held at the Teele’s home on Cummings Lane. Mr. Teele presented a paper to the Literary Club in June 1908, and it is described in the minutes of the group as “A Paper on Irrigation in the United States and Foreign Countries, illustrated.” He gave a second paper, “The Government and the Farmer,” at the March 1909 meeting. In October 1909, the Teele’s hosted the group again. As part of the program for the evening, Mr. Teele read selections from the humorist Artemus Ward. In 1912, Mary Teele joined the Chevy Chase Reading Class, a woman’s reading and discussion group which met weekly. She was also a member of the Economical Epicureans. They met once a month at each other’s houses, to share a special “gourmet” luncheon which had to adhere to a strict budget. According to Miriam Richards Hoffman, the daughter of Fanny Richards, one of the other members, the husbands of the women in this group decided to have their photograph taken and present it to their wives with the inscription: “Honorary Economical Epicureans.” Ray Teele was part of this group, and in this photograph, he is on the far right, in the first row. Albert N. Prentice, the architect for both the Teele and Stone house on Cummings Lane, is also in the photograph. The “Honorary Economical Epicureans,” no date. 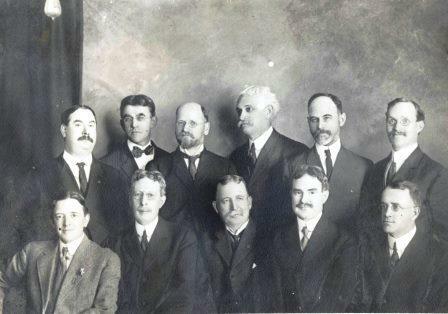 Back Row, Left to Right: Eugene Stevens, Charles Weaver, Thomas E. Robertson, Charles Parker, Clift Rodgers Richards, Albert N. Prentice. Front Row, Left to Right: Clarence E. Dawson, Edward Mix, William T. Curtis, Vernon E. Hodges, Ray Palmer Teele. Donated by Edith Claude Jarvis. CCHS 1988.05.26. Although Mr. Teele had risen in the Department of Agriculture to the position of Assistant Chief of Irrigation Investigations by 1912, in April of that year, he was indicted, along with three others, on charges of approving and presenting false vouchers to the government. By August, prosecutors had conceded that the violations were only technical and that the employees of the Department of Agriculture had received no personal benefit. Ray Teele was found not guilty. In April 1918, Ray and Mary Teele signed a deed conveying the property to Ferdinand L. and Clara Reichmuth. The Teele’s moved back to the District of Columbia. 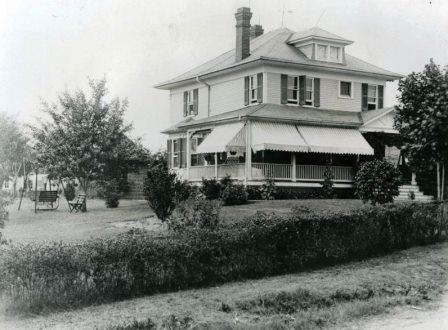 The Reichmuth’s owned 3502 Cummings Lane until 1937, when they sold their house to Robert and Mary Louise Judd. The Judd’s lived at the house on Cummings Lane for just five years. In 1942, they sold it to James A. and Pauline G. Thurman. The Thurmans owned it for the next 55 years. 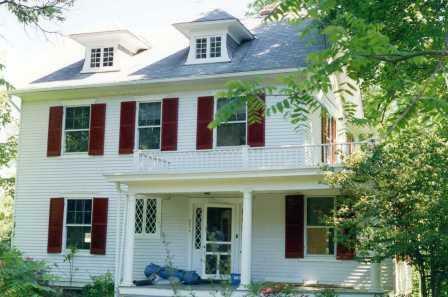 In 1997, the Thurman family sold the house to Stephen and Ellen Conley. The Conleys renovated the house, expanding the first and second floors, and extending the porch around the house in both directions. 3502 Cummings lane, before a 1997 renovation by the Conley family. Photograph by Ellen Conley. CCHS 2013.11.01. 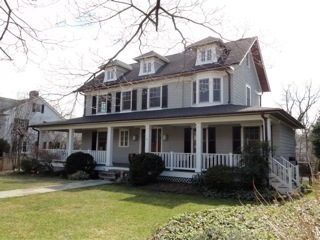 In 2007, the Conleys and their children moved to Chevy Chase Village, selling their home to Peter A. and Patrica Cyr. The Cyrs lived in the house for just two years, selling to the current owners, Spence M. Patterson and Renata A. Serafin in 2009. The Pattersons have made their own renovations, adding a summer house and a pool. 3502 Cummings Lane in 2013, after two major renovations by the Conleys and the Pattersons. Photography for CCHS by Susan Bollendorf. Occasionally the Cummings horses and a cow or two would get loose and wander through our yard cropping grass and munching from our garden. At times a few of his chickens wandered in. Everyone in the area kept chickens for fresh eggs and an occasional fryer -- even the Ormes. Click NEXT for our final section of this exhibit.